Three weeks into my chaplaincy training at Georgetown University Hospital in Washington D.C, I was paged to a patient’s room. It was my overnight shift in the hospital. In comparison to the hustle and bustle of the day, the hospital felt eerie and empty at night. As I got to the floor, I was relieved to see several nurses working at the nurse’s station computer, their faces illuminated by the glow of computer monitors. “The family wanted a priest,” was all they could tell me. appropriate page. In my mind, I had rehearsed my introduction to the patient’s family and friends a thousand times. Now, I stood outside the door of the room at the end of the hall. I felt the awkward nervousness that accompanies wearing a Roman collar and looking like a priest, while not yet a priest. This was it. It was my last chance to turn back towards the nurse’s station, and dial the emergency number and call for a realpriest. “We are so glad that you are here. He just died,” they said. The wife and daughter of the patient looked relived and grateful to see me. I could not stand the risk of disappointing them, and adding to their suffering. Despite all my preparation and training, I blurted out “I’m not a priest.” They looked puzzled, and said “That’s OK. We just need someone to read the prayers for the commendation of the soul.” Scrambling to recover, “of course,” I replied. I opened the book and began to read. My voice was halting and slow. Their responses to the prayers sounded clear and firm. By the time I finished the grief was plain on my face. The wife began to reassure me “It’s alright, he lived to be 92 and it was a good life…” As they went on, I felt embarrassed. They were now caring for me! This was not exactly a good start for a ministry that I was sure God had called me to do. Navy. When I was seventeen, waiting in line for my first military haircut a chaplain just came up to me and started talking to me. I don’t remember what he said, but I remember thinking “nice guy”, and feeling a bit relieved to have a friendly face as I charged into bootcamp. I also remember the chaplain’s great care in delivering the news of my grandmother’s death while stationed in Japan over seven thousand miles from my family. 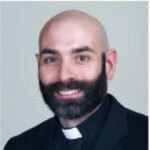 Now, as a priest, I am inspired to provide the same type of help to people in their darkest moments. I admit that it is hard to know what to say in these situations; what’s helpful in one situation may not be helpful in the next situation. Sometimes, a prayer from the heart is most needed, other times, when words fail, we borrow the Church’s words found in rites and rituals. Each hospital room is a world, and each person a mystery. And sometimes, despite your best efforts, you wind up caring for each other in these situations. I hope to continue learning and growing by accompanying you, the parishioners at St. Thomas Moore, through the joys and the hopes, the griefs and the anxieties of life here in Decatur. Becoming a priest has been one of the greatest joys of my life. It is a pleasure to be sharing with you.